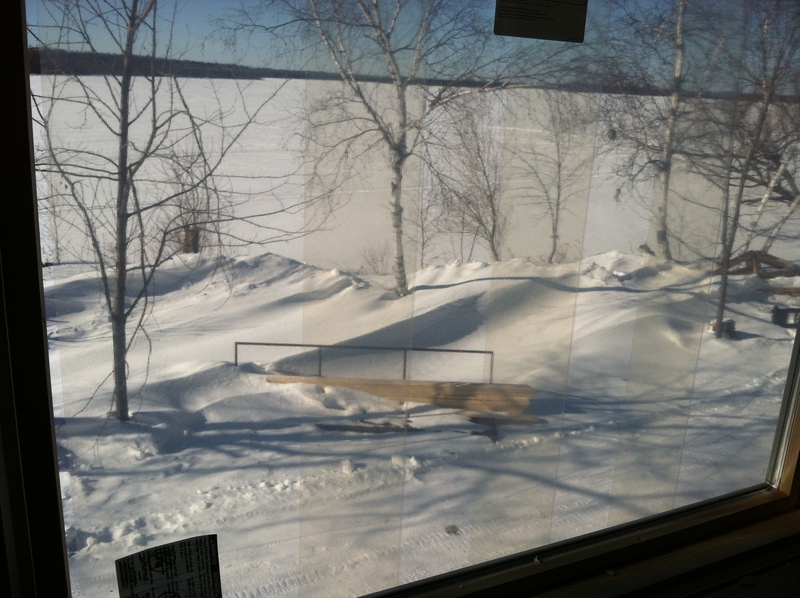 Groomed Snowmobile Trails, Fresh Snow and Perfect Weather! 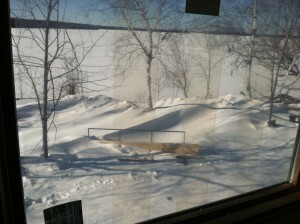 Fresh snow has made the landscape beautiful and the groomed snowmobile trails and x-ski trails excellent! I think all of us can agree that winter has been pretty long so far. And the fact that it is only mid-February might make some folks head for the nearest airport to escape the cold. However, Mother Nature has finally given us a break this week with perfect snowmobile and x-ski trail conditions, fresh snow for grooming and “warm” temperatures to enjoy it! Guests staying at Wildwood over the last few weeks are reporting near-perfect snowmobile trail conditions with all local trails being groomed regularly. It has been a busy winter for us and that hasn’t left a lot of time for riding our own snowmobiles. But on Friday night we finally got out on the trails ourselves and although it was not a long ride it was an amazing one! We picked the kids up from school and headed up to Marcell with plans to ride with friends. We hit the trails around 4:30 with clear skies and sunshine. We rode west on the Bowstring trail into the setting sun and as it dipped below the horizon it turned the sky pink and purple. Trail conditions were really good and were made better when we met the groomer out on the trail! The temperature dropped pretty quickly after the sun went down so we didn’t ride too long before we decided to turn around and head back the way we came. We had the kids along and wanted to eat steak at the Timberwolf Inn so the increasing cold and hunger pangs drove us back toward Marcell. Shortly after heading east again I was catching light out of the corner of my eye. I kept thinking I was seeing headlights of oncoming sleds. However, it didn’t take long to realize that the light was coming from the rising moon. It looked like it was playing peek-a-boo through the trees. With the clear sky the light from the full, yellow moon was amazing. It was so beautiful that it was hard to concentrate on the trail! With warmer temperatures forecasted for the coming week we look forward to getting more time on the snowmobiles. We hope you do, too! Ice fishing on Bass Lake has been a little slow this winter. We can only guess that the crazy, cold temperatures impacted the fish as much as the rest of us! We had ice fishermen in over President’s Day weekend who reported the the fishing wasn’t red-hot but they caught enough sunfish throught he ice to limit out. While we only maintain our access for ATV and snowomobile traffic the ice conditions are great for travel by truck as well. 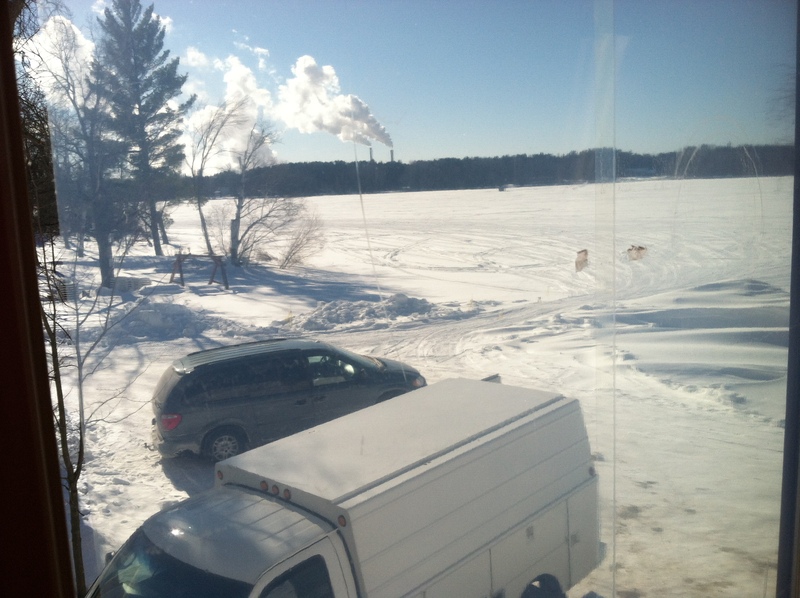 Last we knew there were no plowed roads on the south end of Bass Lake. Finally all the windows and the front door are in! 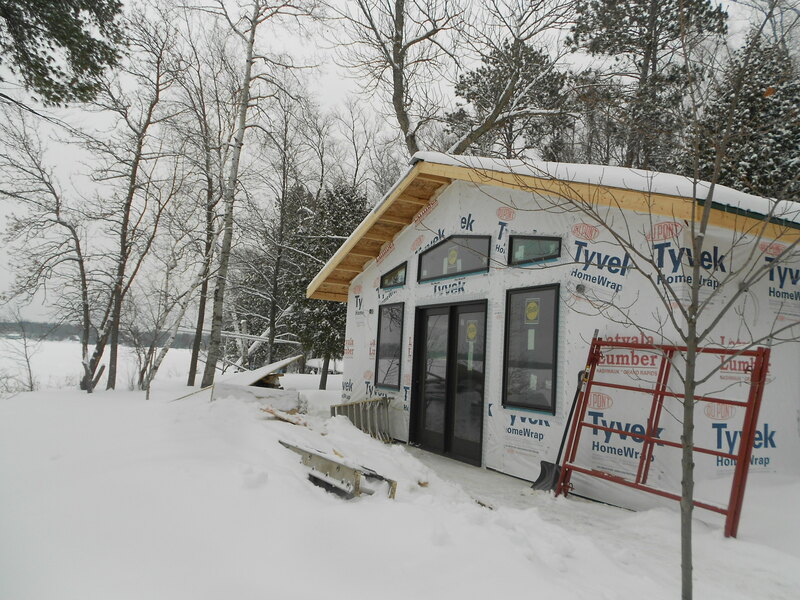 Our project is going well and it has been fun to start thinking of the winter of 2015 when we will have nine cabins open for winter business. Of course, we have to get them built first so that’s still our main focus right now. 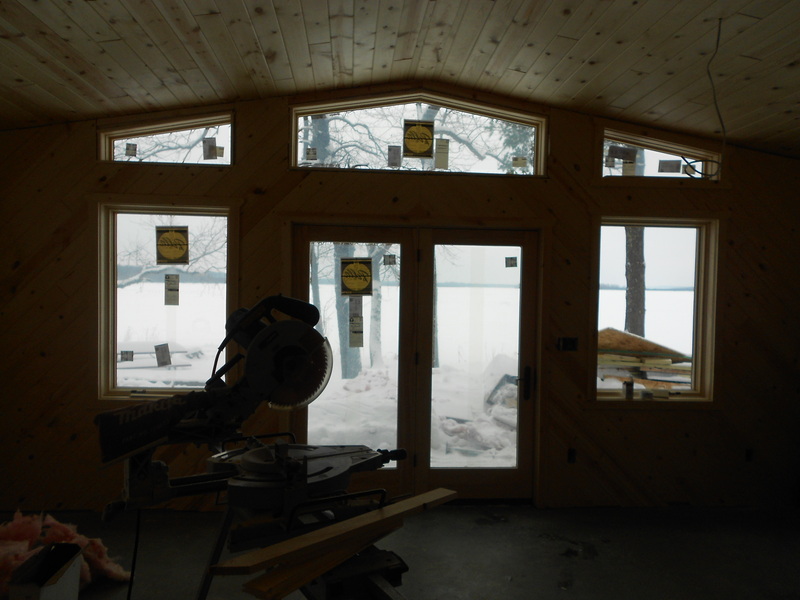 Our contractors and Jay have been making great progress and all four cabins are coming along nicely. We ordered kitchen cabinets last week and have finalized our flooring decisions. Those feel like two big milestones right now. 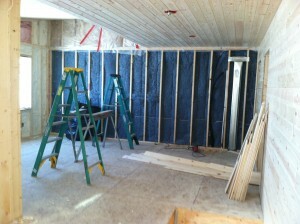 After this week we will be ready for the painting contractor to come in and seal up the walls, windows, doors and trim. 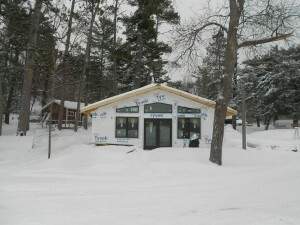 Although we are trying not to get our hopes up it’s hard not to imagine getting Aspen Lodge, Oak Lodge and Cedar Lodge done before May so we can concentrate on getting the rest of the resort ready for summer! 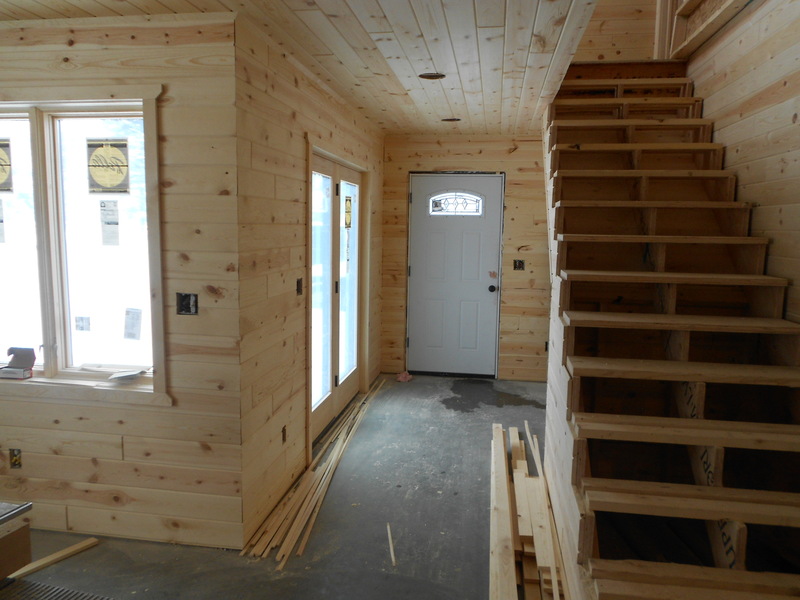 I included some updated photos in this blog but you can also check out our Facebook page for the latest photos on our new cabins. 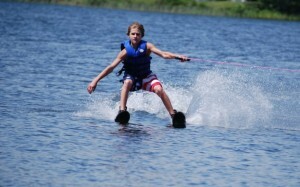 Here is a little Minnesota “summer vacation” to get you through another winter day! 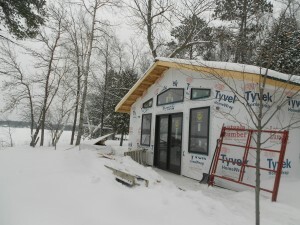 While our time and energy is focused now on winter business and building new cabins it’s always nice to hear from people who have started to think about taking a Minnesota family vacation to Wildwood this year. I appreciate talking about walleye fishing (on open water) and discussing the merits of renting a pontoon for large family reunion groups. As I answer “Mom” questions about our safe, sandy beach and our supervised kid’s activities it makes me anticipate warm, summer days on the lake and the sun on my face. It’s certainly been a long winter but let’s all remember that it won’t last forever and summer WILL return. In 12 short weeks it will be Minnesota Fishing Opener followed immediately by the kick-off of the summer vacation season. As hard as it is to believe we will be digging out our summer clothes soon so just tuck those warm thoughts under your stocking cap as you enjoy the last month of winter! 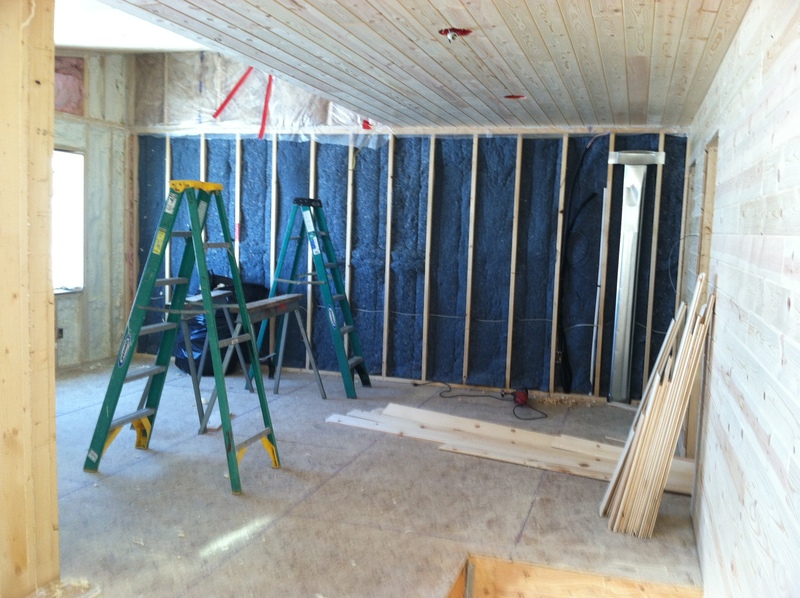 We installed a sound-deadening insulation on both sides of the adjoining wall in the duplex. There will be a nice closet for storage and an extra fridge under the stairs in the entry of Red and White Oak Lodges. 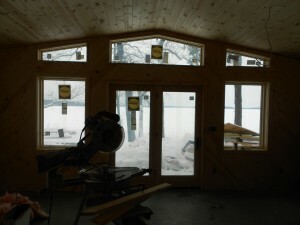 The addition of the above the door really finish the look of Aspen Lodge. 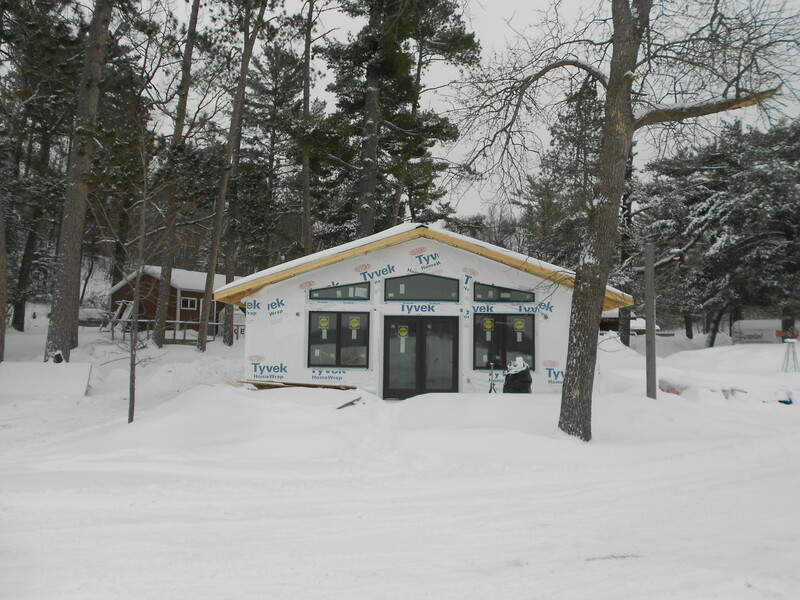 Finally all the windows and the front door are in Cedar Lodge!